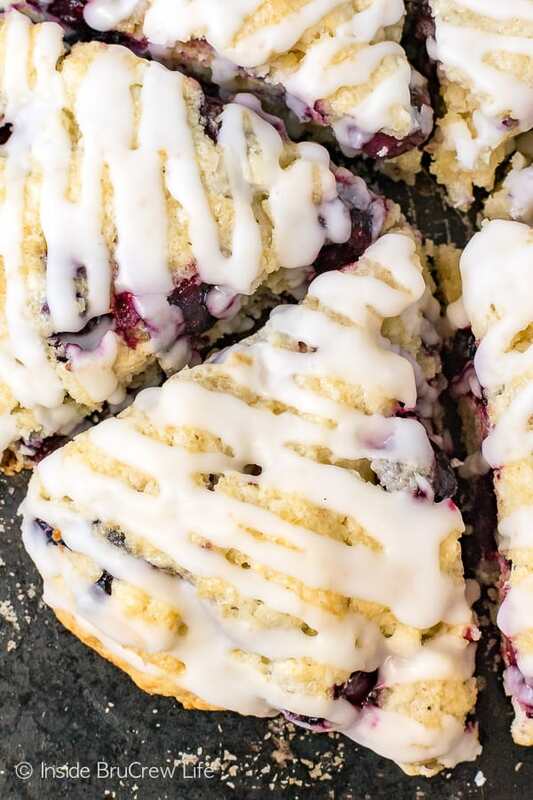 These easy Blueberry Coconut Scones are loaded with fresh berries and topped with a sweet coconut glaze. Easy breakfast pastries are a great way to jump start your morning routine. Add a mug of this Coconut Nutella Latte and your morning will get even better. *Love these recipes? Be sure to sign up for the BruCrew email to have these recipes delivered to your inbox each time a new recipe is shared. CLICK HERE TO PIN THIS RECIPE FOR LATER! Recently my husband asked me to bake some scones. Now I am ALL about getting in the kitchen, so I was thrilled for yet another reason to bake some thing delicious. The dilemma that I faced was that part of his scone request was that they were “non candy bar” scones. Say what? I prefer to add all the candy and sprinkles to everything. And he knows this, so he had to make sure his request had limitations on it. Well, I guess that means I should put all thoughts of these Loaded Butterfinger Banana Muffins, this Chocolate Cookies and Cream Banana Bread, or these Java Twix Oatmeal Bars out of my head because he said no candy or cookies are allowed. He also said those things should never be allowed in breakfast options, but obviously I don’t listen to that kind of nonsense. LOL! I mean if pancakes and syrup, donuts with frosting, and cream cheese filled pastries are considered breakfast, why not candy and cookies? Same thing if you ask me. Usually when I bake, there is almost always some sort of chocolate involved. That’s just how I roll. 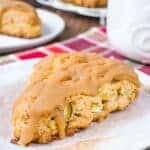 So coming up with an easy scone recipe that didn’t involve any chocolate or peanut butter was a little challenging.But I’m always up for a challenge in the kitchen, so I headed to the pantry to see what I could find. I found a bag of shredded coconut, and I knew that I had just bought some fresh blueberries for the berry monsters in our house. 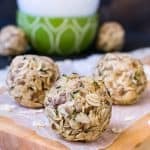 Right away I knew that that combo needed to happen again because these little Blueberry Coconut Granola Bites are one of my favorite healthy snacks. 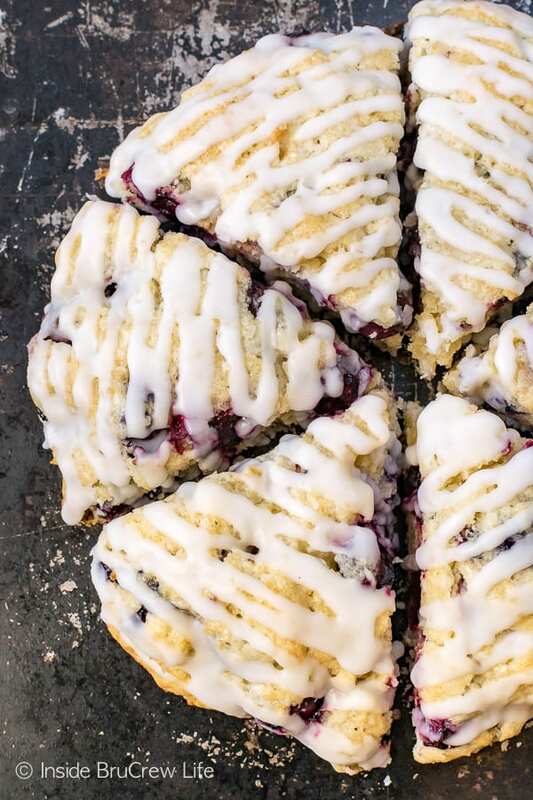 Preheat your oven so that when you are ready to slide the pan of scones in the oven, it is ready. Whisk all your dry ingredients in a bowl. Add the cold butter and cut it in with a pastry blender or fork. It is very important to use cold butter. Another easy trick is to grate frozen butter into the flour mixture and stir it all together. Place the bowl and ingredients in the refrigerator while you prep the rest of your ingredients. This is just another way to keep your butter cold. Warm butter melts faster and creates a greasier texture in these baked goods. Add any fruit or extra ingredients to your flour mixture and stir gently. Create a “hole” in the center of the flour and pour in all the wet ingredients. Use a fork to gently pull the dough together. Place the dough on a baking sheet and press into a circle. I like to bake mine in one big circle and then cut them after they have baked most of the way, but you can also cut the dough now and gently separate the triangles. This will create a crunchy exterior all around while the inside stays soft. I don’t know about you, but I always thought homemade scones were extremely hard to make. I think it is just because the word scone sounds extra fancy. Just say “I’m having a cup of tea and scones this afternoon” out loud. Sounds uppity doesn’t it? And I had a few bad experiences with scones in the past that kind of hindered me from wanting to make them. You know the experience I’m talking about, right? Dry and kind of tasteless. That’s not exactly how I want to use my calories for the day. If you make your scones the right way, they are light, flakey, and melt in your mouth. 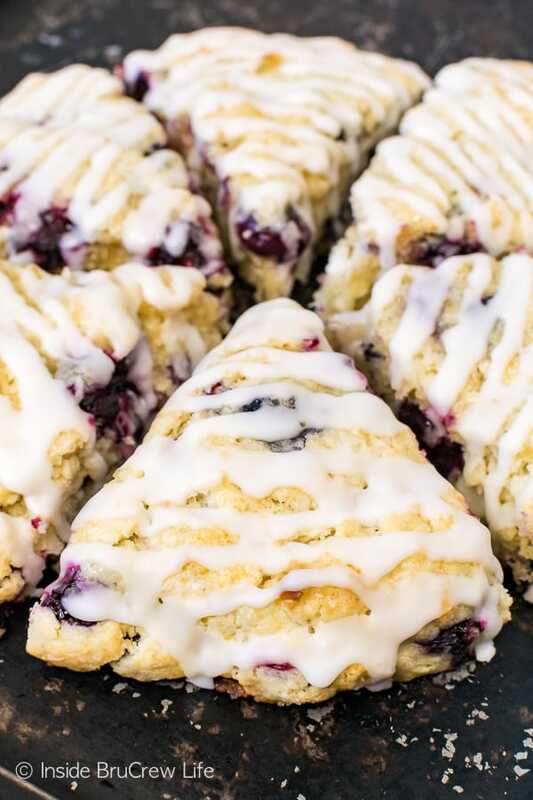 Heavy cream and fresh berries give these Blueberry Coconut Scones a light texture with pops of juice. And then the coconut glaze drizzled on top just adds a slight tropical flavor that is out of this world. It’s a flavor combination you just have to experience. 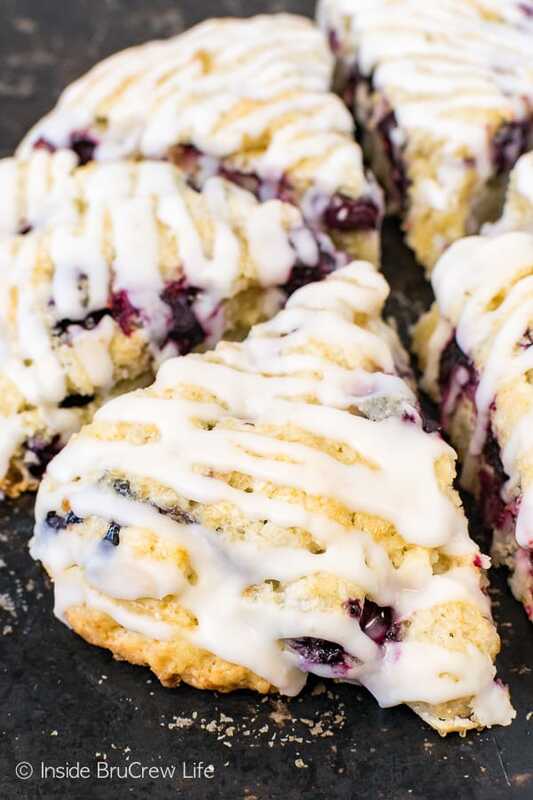 These easy Blueberry Coconut Scones are a delicious treat to enjoy with your morning coffee. They are equally as delicious if you enjoy them in the afternoon or late at night though. If you were wondering. 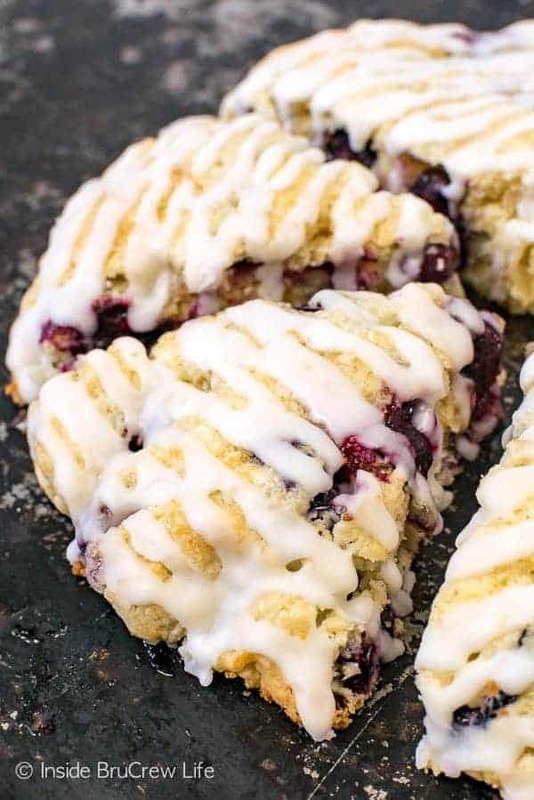 Head over to the blueberry fields and pick lots of blueberries this summer because these soft fluffy scones need to happen over and over again. And if you want the best blueberry scones, just leave out the shredded coconut and use vanilla extract instead of coconut. Enjoy! Make a batch of these Chocolate Chip Pancake Muffins for a quick grab and go breakfast on busy mornings. These Nutella Pop Tarts are a fun and easy breakfast treat that everyone loves. 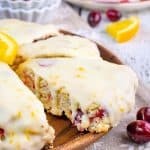 A slice or two of this light and fluffy Lemon Yogurt Breakfast Cake from The View from Great Island and a bowl of fruit would be perfect for breakfast or brunch. 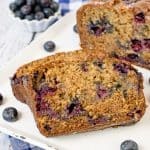 This Blueberry Banana Bread would be a healthy way to start out any morning. 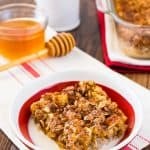 Keep a pan of this Easy Overnight French Toast Casserole from A Mind Full Mom when you have house guests. 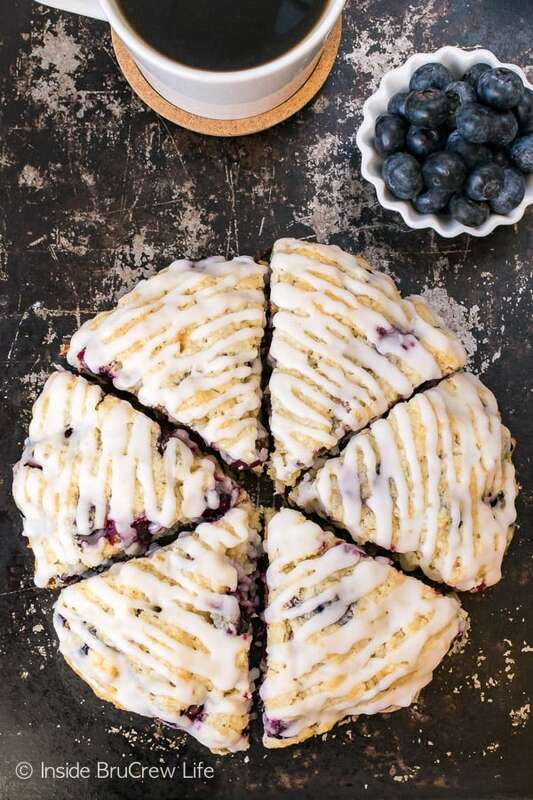 Buy extra berries at store to make this Blueberry Breakfast Cake from Saving Room for Dessert for a sweet weekend breakfast. Connect with Inside BruCrew Life! Be sure to follow us on our social media, so you never miss a post. I also created a fun new Facebook group, and I would love for you to join. It’s a group where you can share your favorite recipes, ask questions, share photos, and see what’s new with the BruCrew. If you would like to check it out, you can request to join HERE. Preheat oven to 400 degrees. Line your baking sheet with parchment paper or a Silpat. Whisk together the flour, sugar, baking powder, and salt. Add the cold butter. Using a fork or pastry blender, mix in the butter until there are no large pieces of butter left. Refrigerate the flour mixture while the oven heats and you prep the other ingredients. Stir in the blueberries and coconut. Create a well in the center and pour in the 3/4 cup heavy cream, egg, and coconut extract. Use a fork to pull the mixture together gently until a soft dough forms. Divide the batter into two even balls. Pat the dough balls into two 6 inch circles. Brush the tops and sides of the circles with the remaining heavy cream and sprinkle with sugar. Bake for 22 minutes. Remove the pan from the oven and cut each circle into six wedges. Pull the scones apart slightly. Place back in the oven for another 3 minutes. Remove and let cool on the baking sheet for a few minutes before placing on a cooling rack. Whisk together the powdered sugar, extract, and water and drizzle on the tops of the cooled scones. Let set. Store in a tightly sealed container. *This post contains affiliate links. Inside BruCrew Life may receive a small percentage from sales made through these free links. As always, these links do not cost you any extra. Thank you for letting us share products we use and love this way. « Trick or Treat Tuesday! I had to pin this! Looks delicious! Yumm! 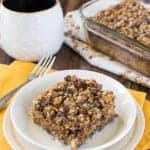 Looking for breakfast to go foods to make and this is perfect, thanks! I love your recipes–I really, really do! !–but I think I have to agree with your man. 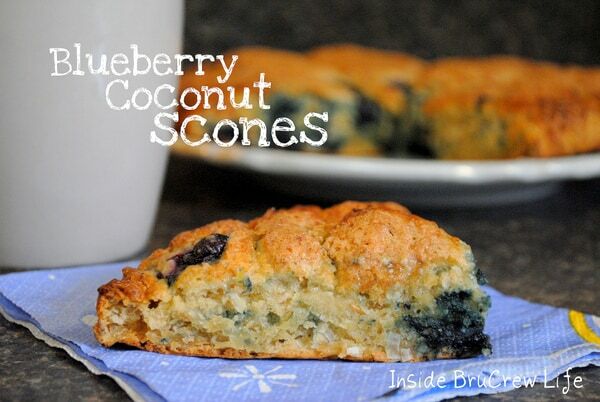 I love blueberry in breakfast and dessert and I love coconut so these are right up my alley! 2 of my favorite things…the blueberry and coconut. But I do agree chocolate would make it doubly delicious! I will have to make these. I made these this past weekend & loved them! Thanks for the great tips too on how to bake them. This is very insightful. I can wait to prepare it for my daughters. Some posts contain Amazon Affiliate links. That means if you click through and buy something from Amazon, I get a small percentage of the purchase at no added cost to you. This money goes towards the cost of running this blog. Thank you for supporting me in this way!